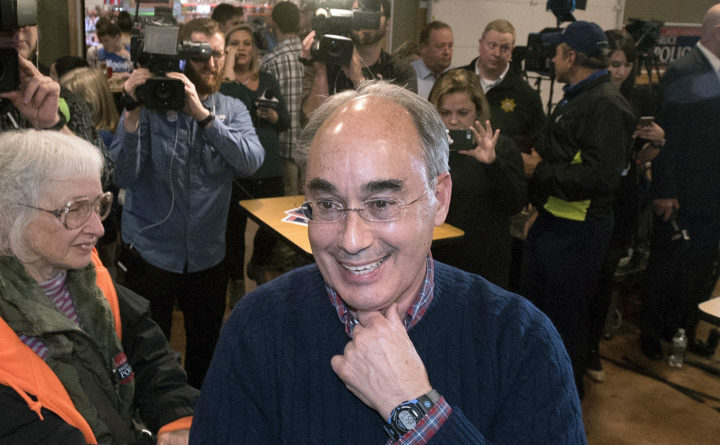 Republican U.S. Rep. Bruce Poliquin, seeking re-election in the 2nd Congressional District, greets supporters at his election night party in Bangor, Nov. 6, 2018. Poliquin and three voters sued Tuesday, Nov. 12 over Maine's new voting system, used for the first time in U.S. House and Senate elections. A lawyer for Poliquin's campaign asked the secretary of state to stop the tabulations to allow a judge to rule, but the secretary declined to stop the process.